1. 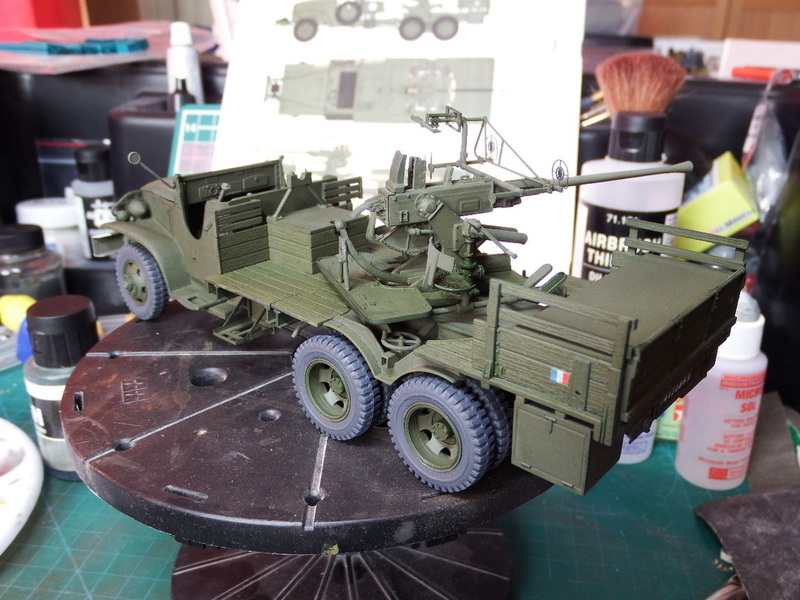 I've fancied building this one for a while now and the latest Britmodeller 'French Fancy' Group Build has given me the opportunity to dig this out of the stash. 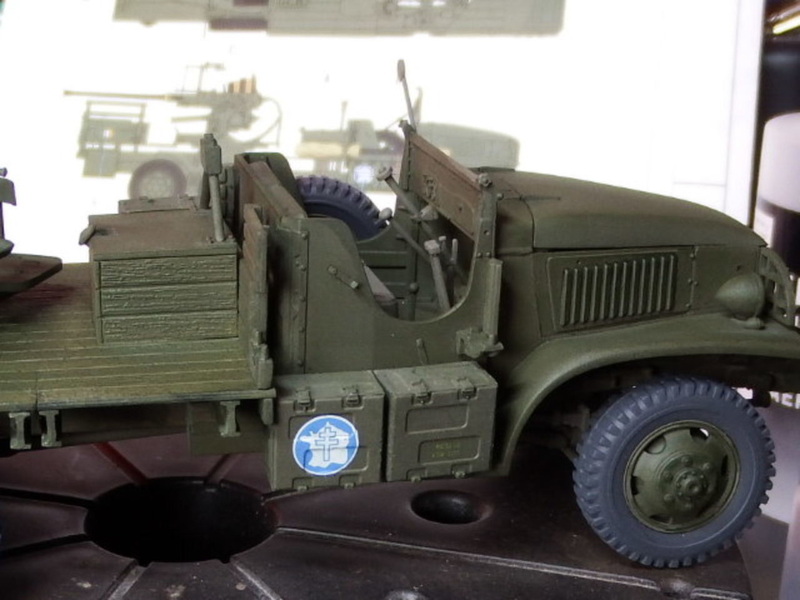 The GMC CCKW 353 truck was modified for many uses being the common standard 2.5 ton truck of the US Forces in WWII. 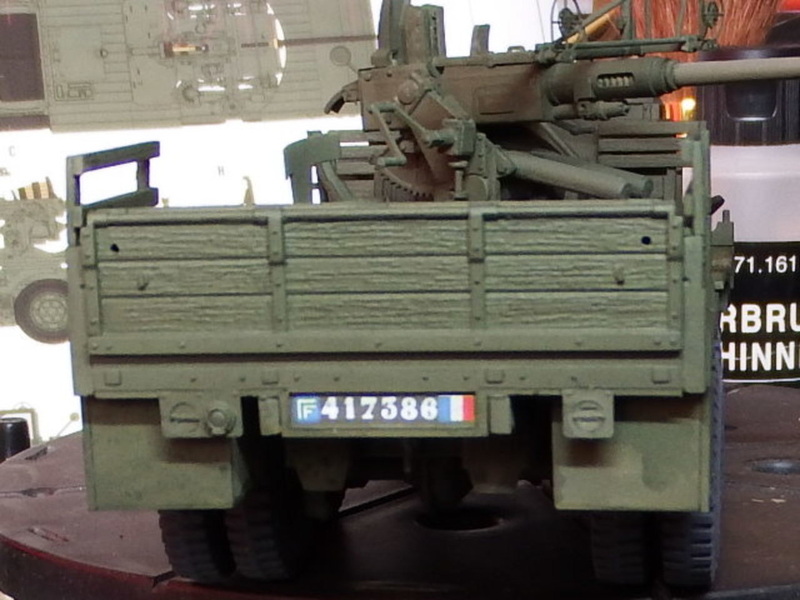 This particular variant was unusual as it was almost exclusively used by the Free French Army (equipped by the USA). 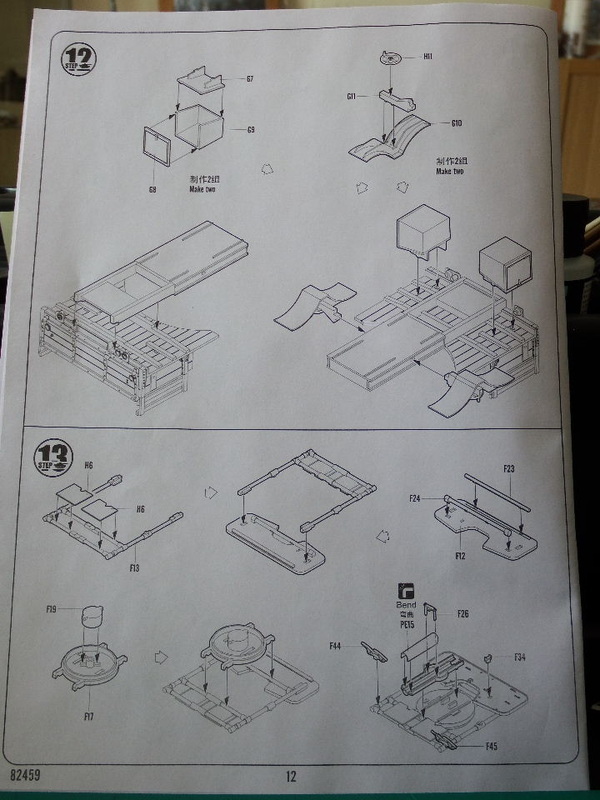 Unfortunately, this kit does not come with a Gun Crew. An up-armoured version was also used, by the French, during their war in Indo-China (before it became Vietnam). 2. Not over inspiring with options on the colours and unit schemes but, how many do you really need anyway? 4. 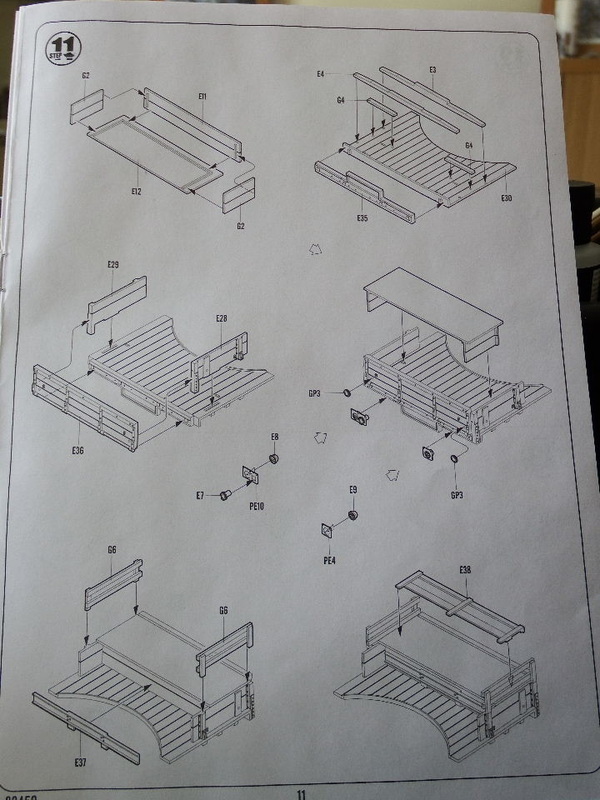 A very straight forward and fairly simple construction with no issues to mention. Parts are crisp and clean with almost no flash to clean up. Parts C22 were the only ones with any ejector pin marks but a small amount of filler solved that - and if you don't do it, you can't see it anyway! 5. 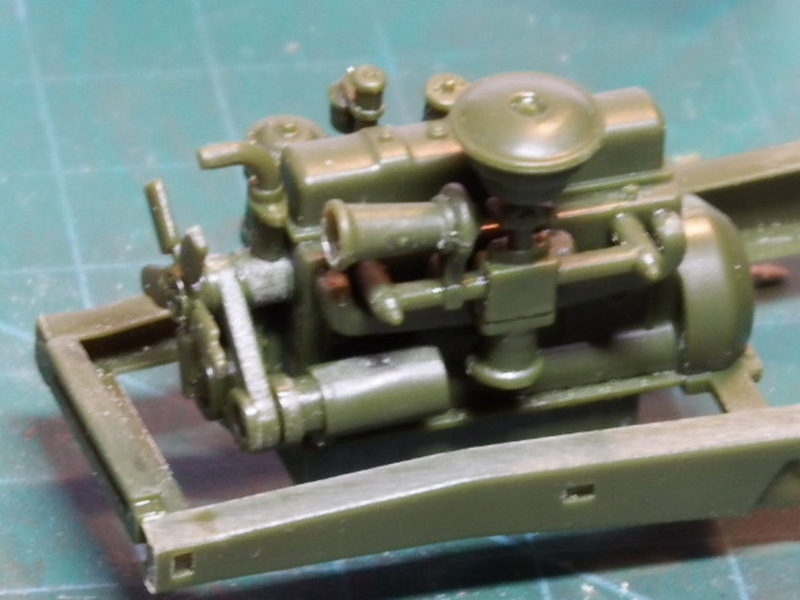 A close up of the GMC Engine which is a nice compact little unit. You can choose to detail it further or leave it as it is - depends on if you are having it visible or not. 7. 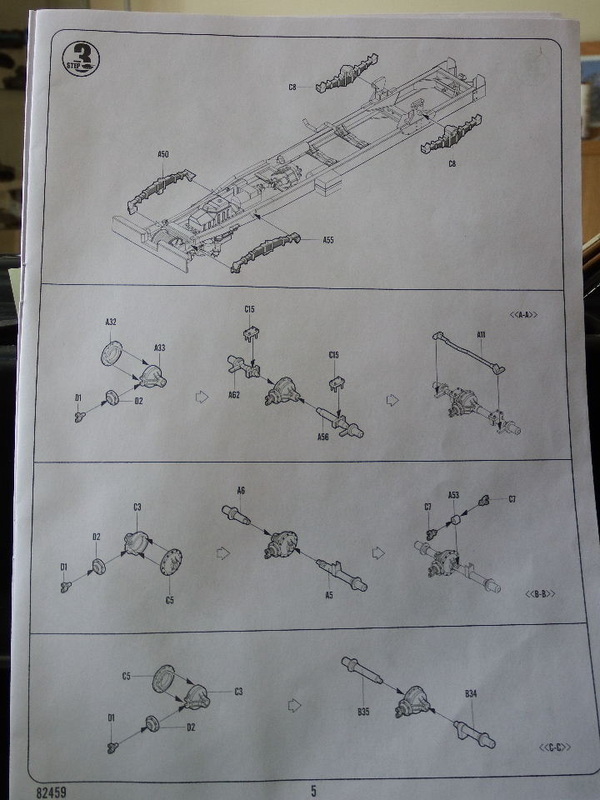 Ensuring that the chassis is true and square is probably one of the most important aspects of a truck build. 8. 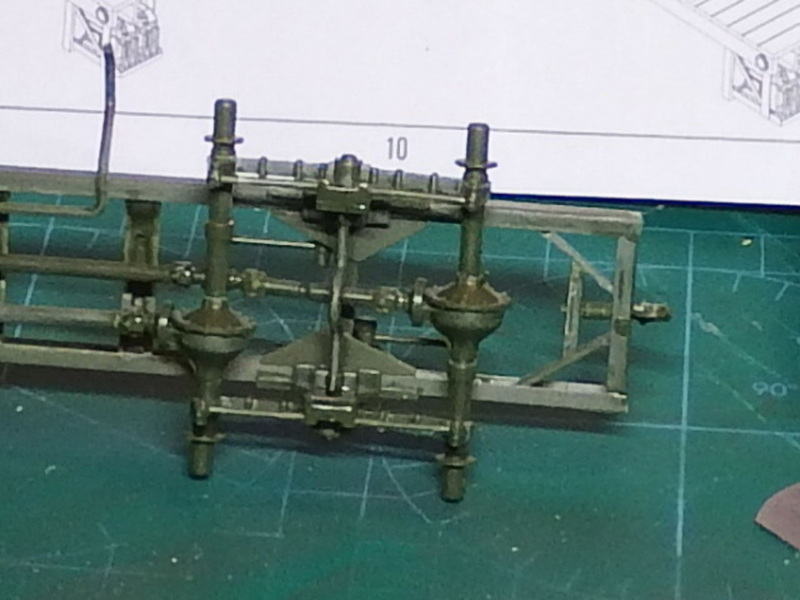 Being able to make all frames fit properly is helped by my new Picador Engineering Blocks. 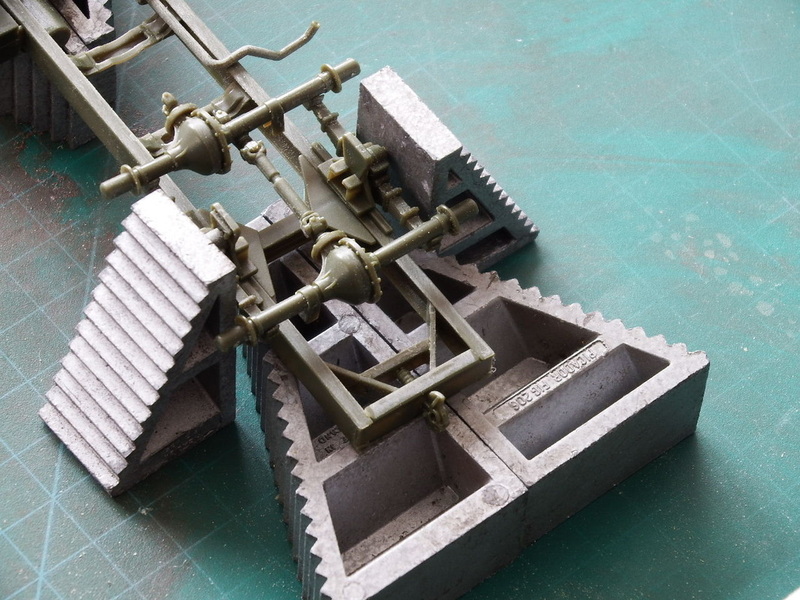 The blocks, 4 each of 2 sizes, have enabled me to provide both a platform jig from which to work and a brace to make sure that all parts fit correctly. Every day I am finding a new use for these items which are steel and weigh a fair bit. 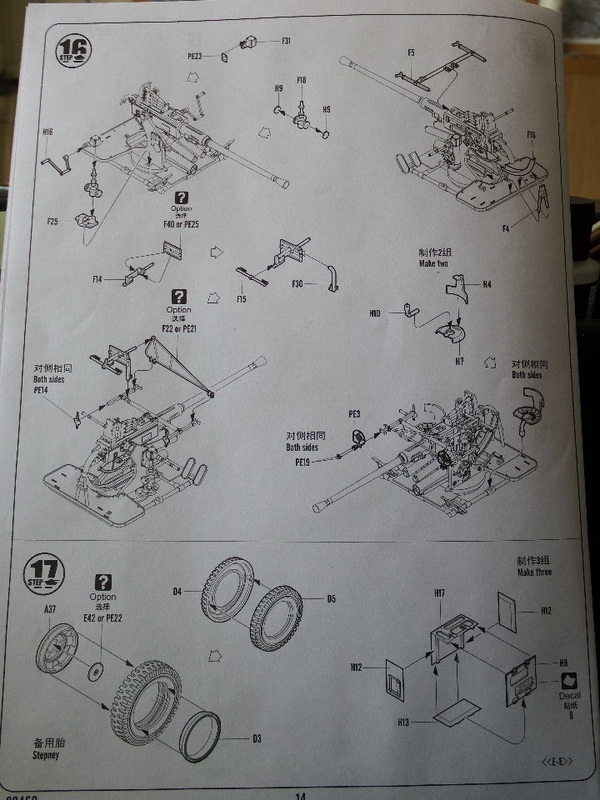 10, You can see here that the front suspension and drive axle have been set into place with the drive shaft fitted. 11. The rear axles are a different story! The 2 block are holding, in place, the rear springs so I can install the 2 rear axles and drive shafts. The process here is that the rear axle pivots on the rear spring array and this need to remain fully level whilst the build progresses. 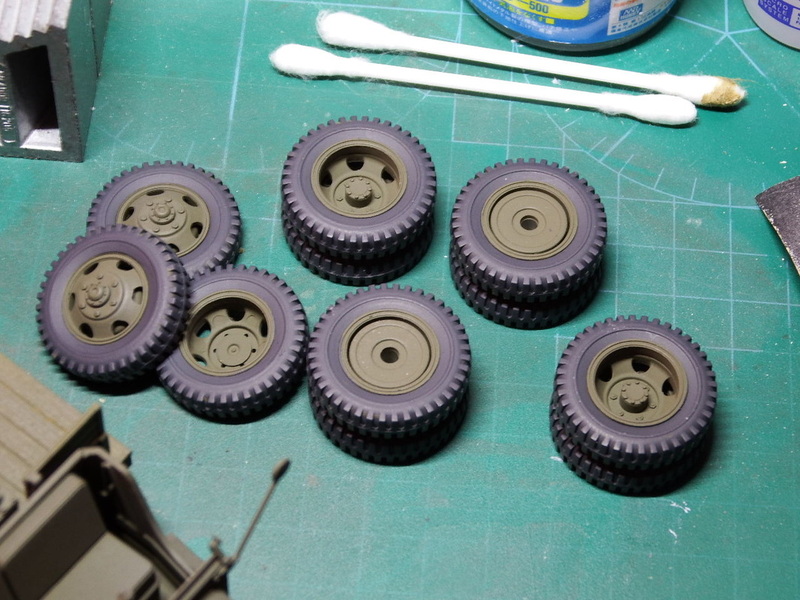 The rear springs are only held in place temporarily whilst the axles and drive shafts are installed and once glued, the whole array can be taken apart for painting. Sometimes these construction jobs take a bit longer than you would originally anticipate and whilst it seems a bit excessive I think the effort will more than pay-off. This technique will also stand the test and be used on future truck chassis builds. 15. 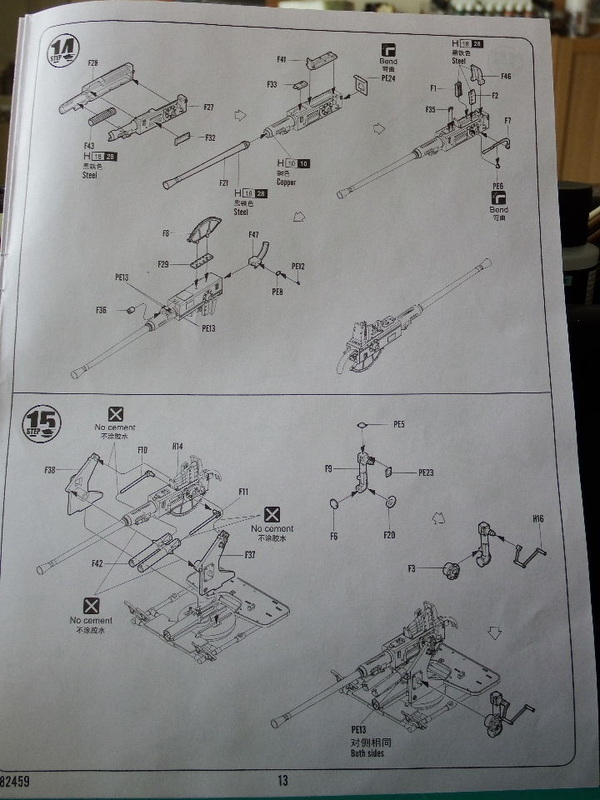 Finally, the front suspension is completed with only the Tyres needing to be fitted. 16. 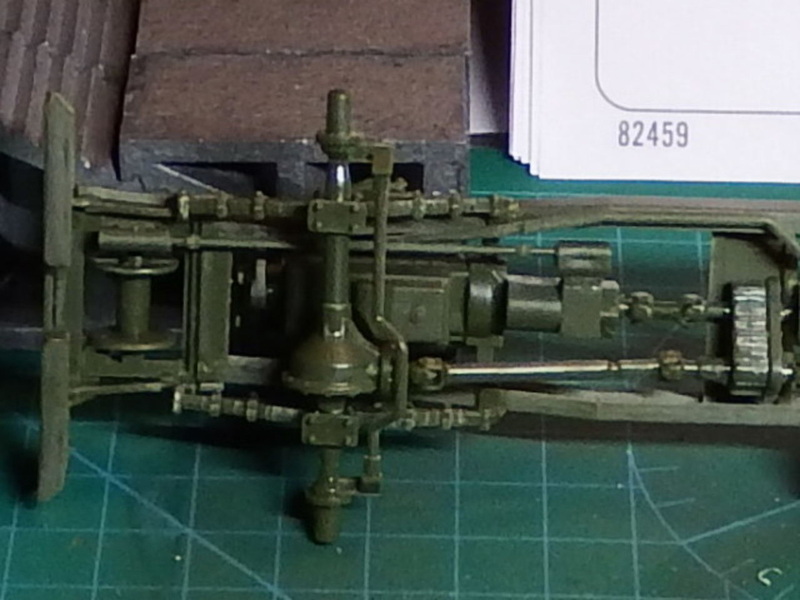 The rear suspension also completed. 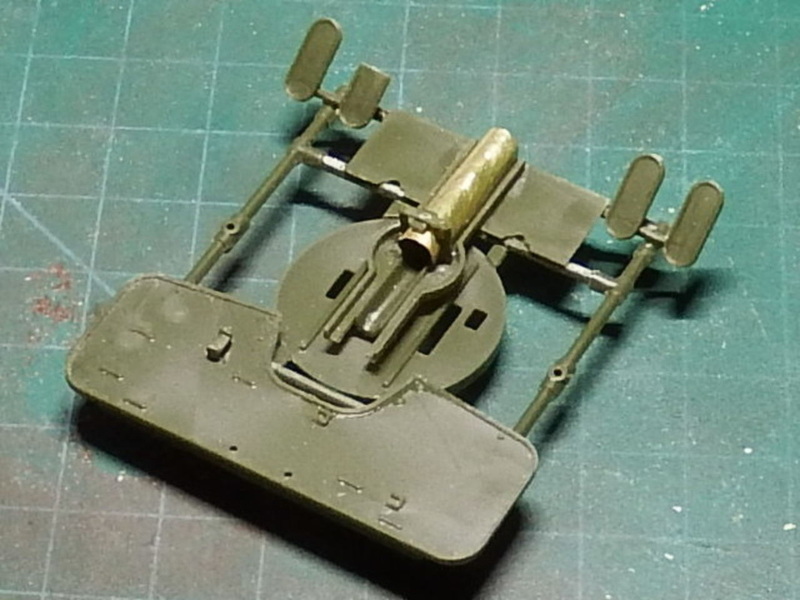 Some minor adjustments were needed to make the parts fit. 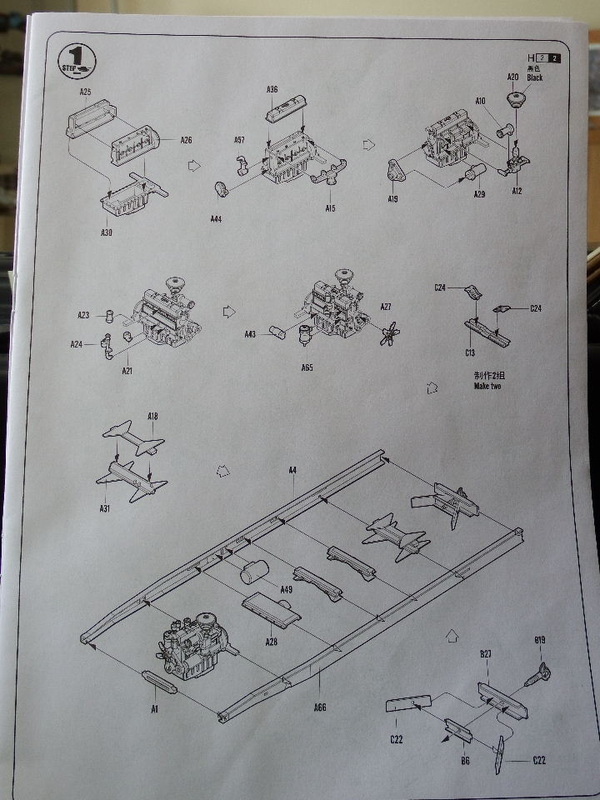 Now, I have to be honest here as I have had to make a minor change to Part A40 (Step 4). The Drive Shaft 'isn't quite long enough' by approx 1mm. I remedied this by removing the slim section, drilling out each side and inserting some plastic rod which I then adjusted to fit. 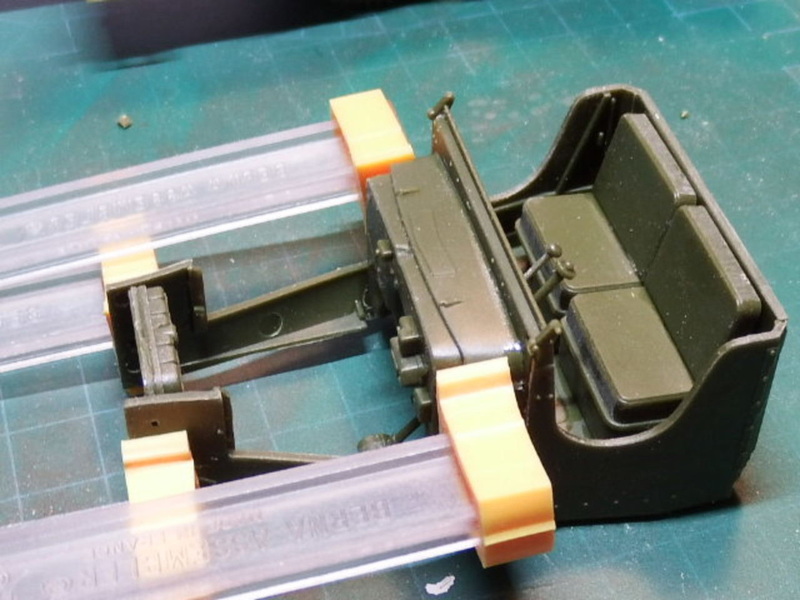 Not a huge deal and you only need to do this because the drive shaft will not glue and will fall out when you turn the vehicle right-side-up. 18. You can clearly see the planking used to construct the Gun Deck. 19. 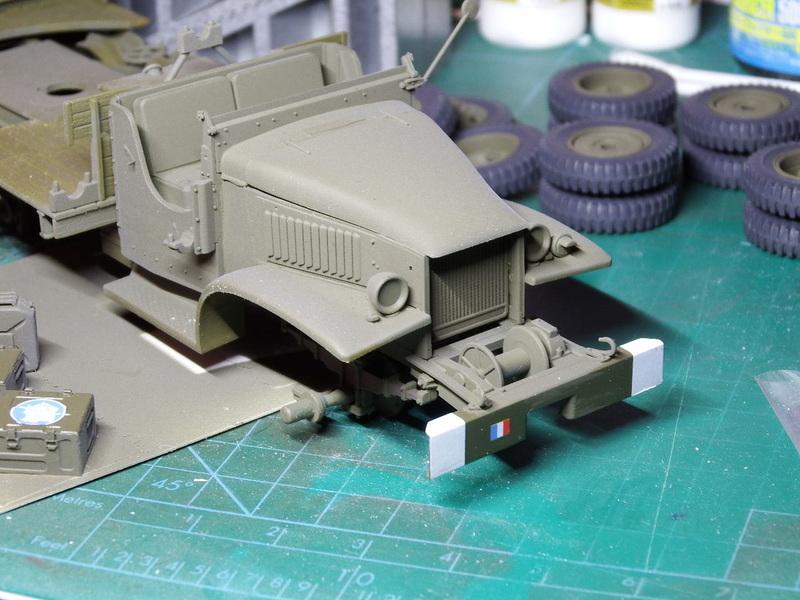 The first use of photo-etch on this model creates the Jerry Can holder. 20. 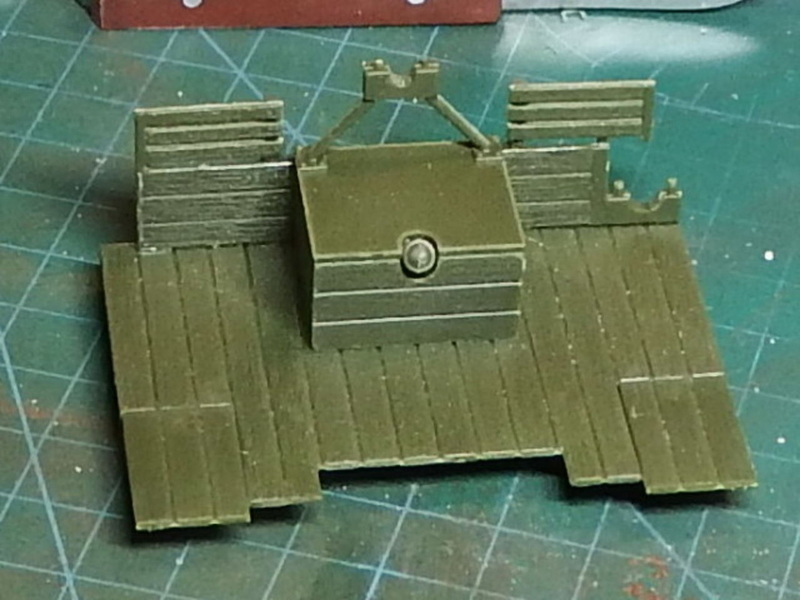 With the deck turned upside down you can see the Jerry Can holder set in place. 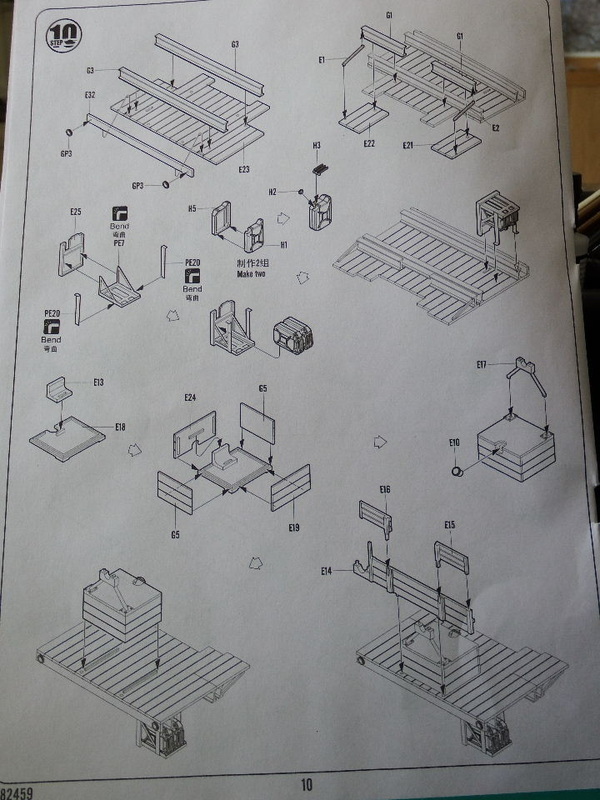 Part E37 does not have any locating pins and will need to be 'eyeballed' into place although the instructions do give a very good indication of the location and the number of planks in the instructions vs the kit match. I have also not yet installed the lights (E7, E8, PE10) & reflectors (GP3) as they may become damaged later as the build progresses. 22. Simple and straight forwards, this goes together really well. 24. 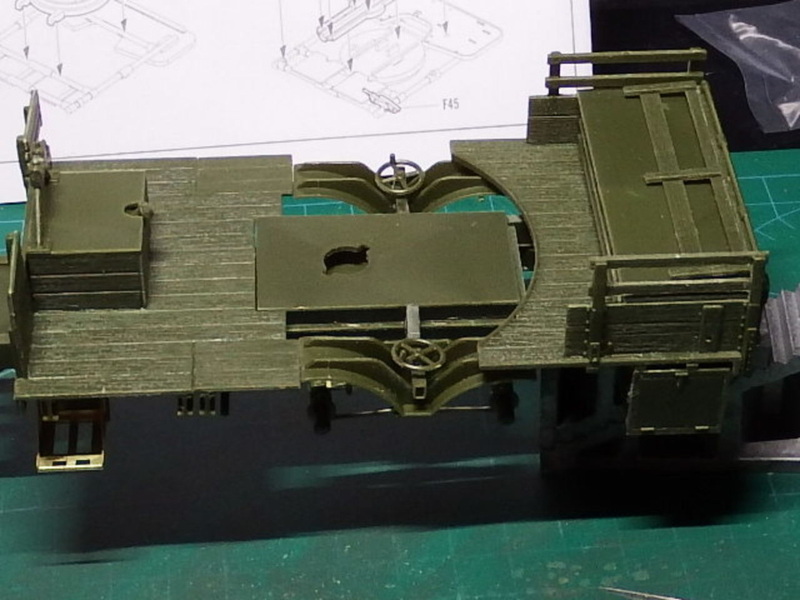 The gun platform which also provides the mount for the rear gun deck. 23. 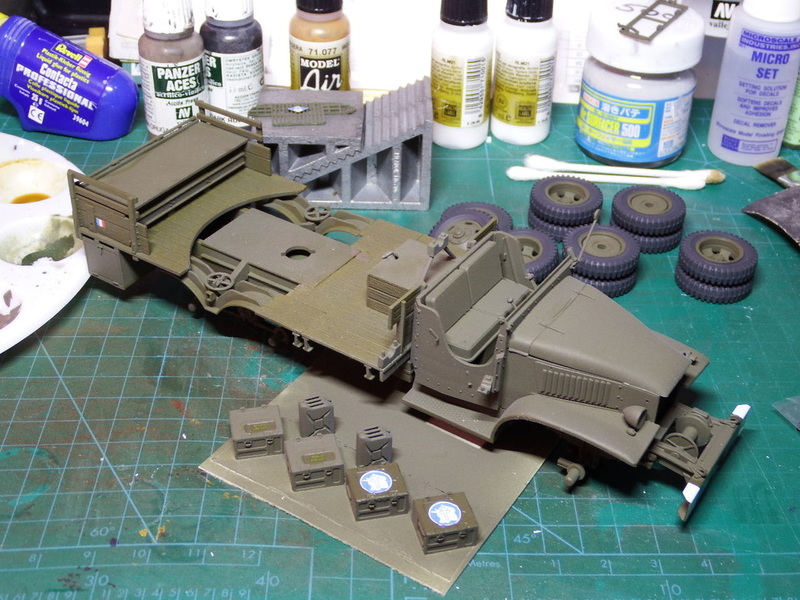 The underside of the rear deck prior to adding the stowage bins. 25. 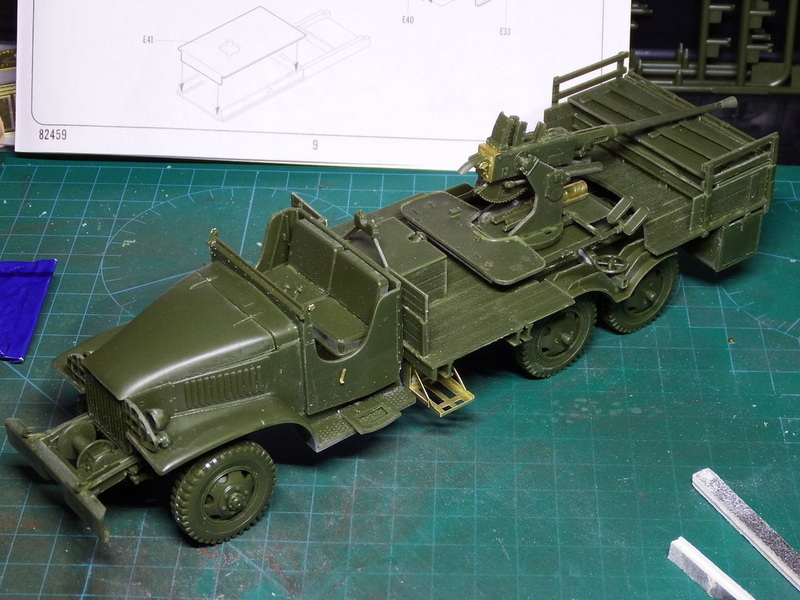 A test fit of the 3 elements fitted to the chassis - looks pretty good and is a perfect fit. 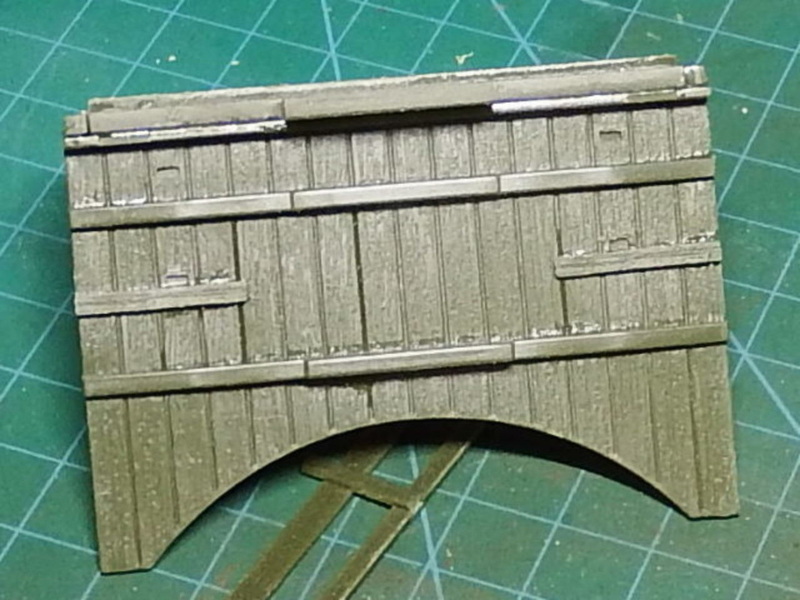 The breakdown of each element of the cargo deck is interesting and actually works out very well. Everything just 'slips together' and fits like a glove. 27. 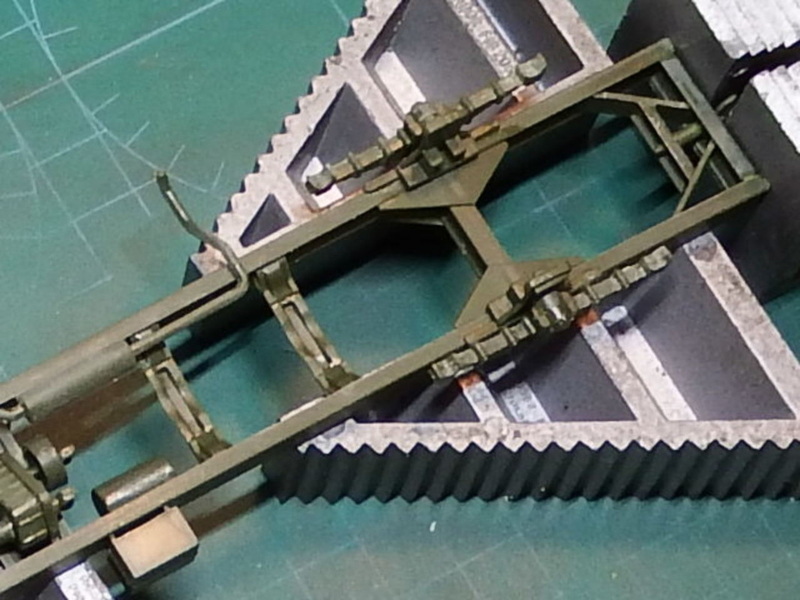 A close-up of the Gun Decks in place (though not glued). It is a snug fit and it sits very well on the chassis. 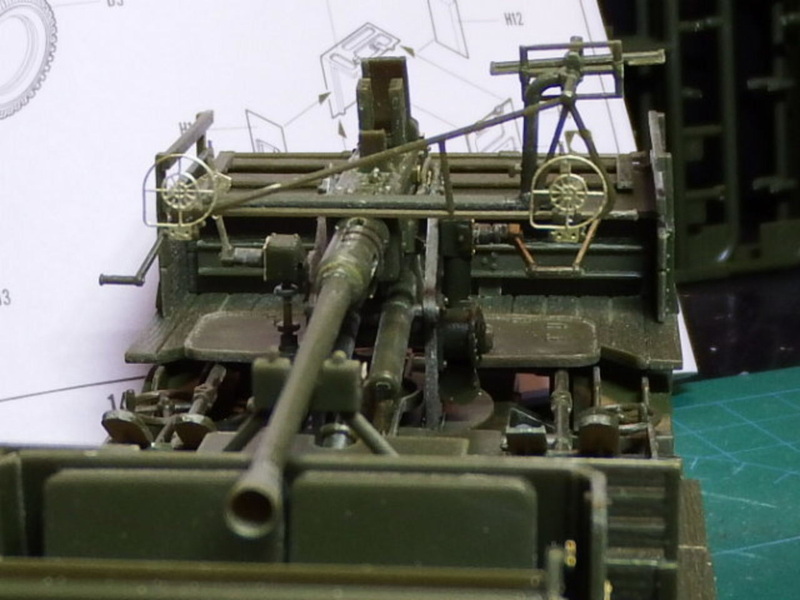 Time now for the 'business end' of the kit with the building of the 40mm Bofors Gun. 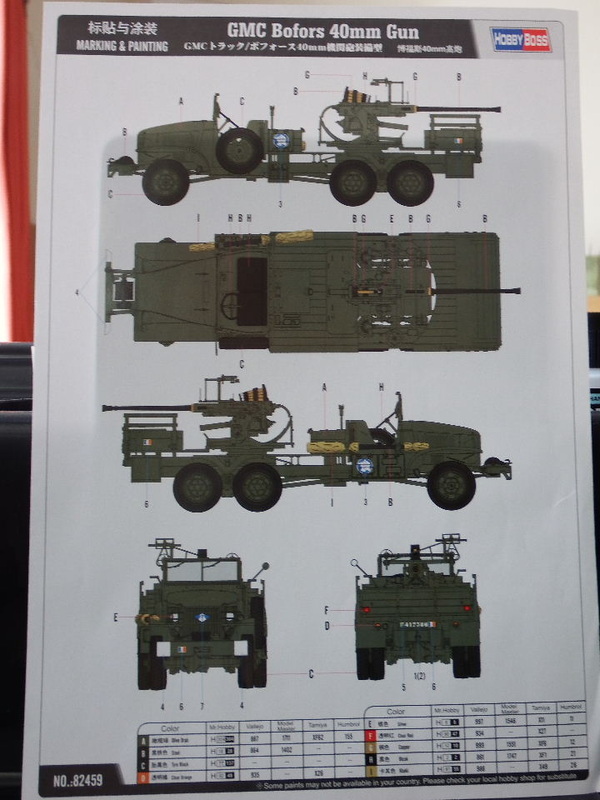 More detailed than Italeri but the Bronco kit has it beat hands down (can't comment on the AFV Club versions). This is more than adequate for this build and does not need to be replaced. 29. 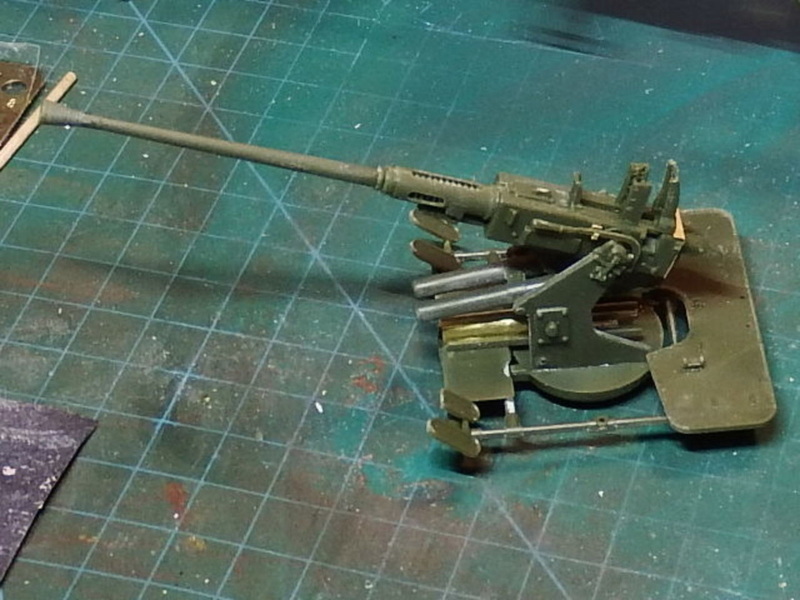 The gun base plate goes together very well and is 9 parts. 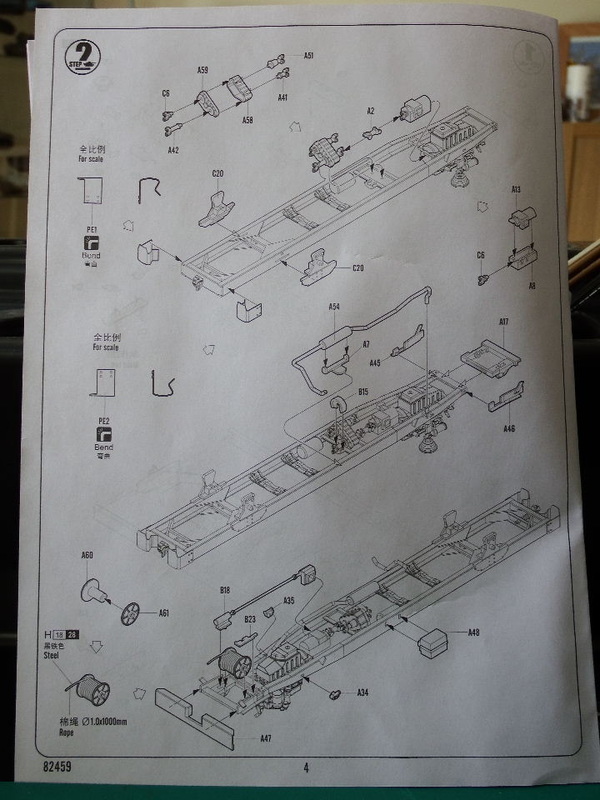 The PE part is easy to bend and DOES NOT need to be annealed. 30. 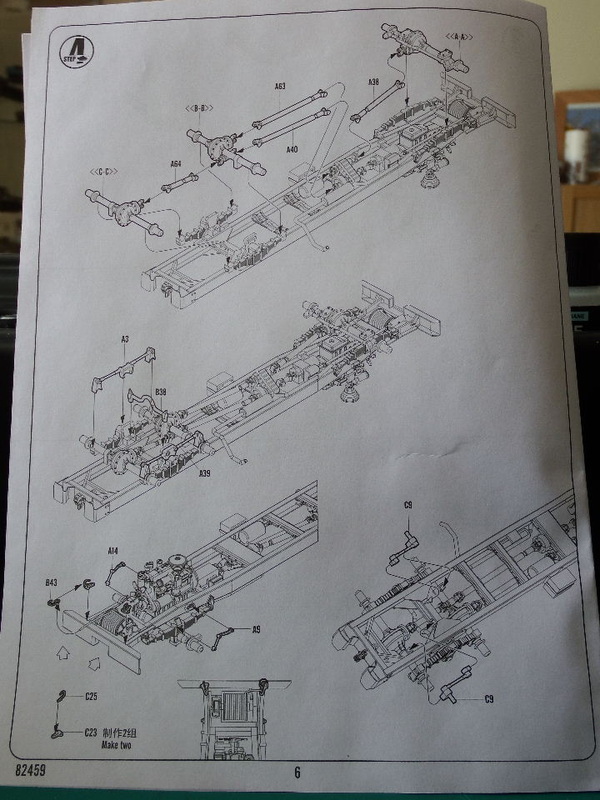 All the gun parts assemble very well and the instruction breakdown is very good but placing of parts PE8 & PE12 needs checking. 31. 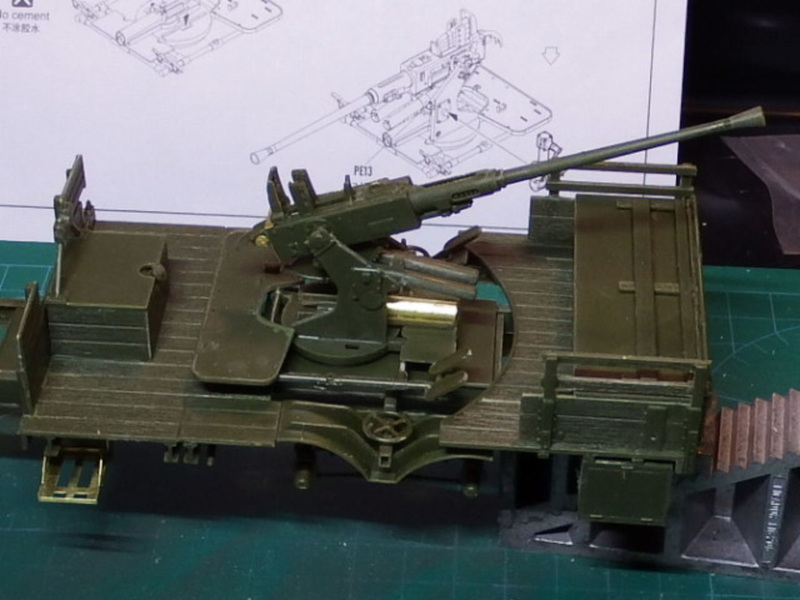 The fit of the gun to the Deck is snug and effective with no issues whatsoever. 34. 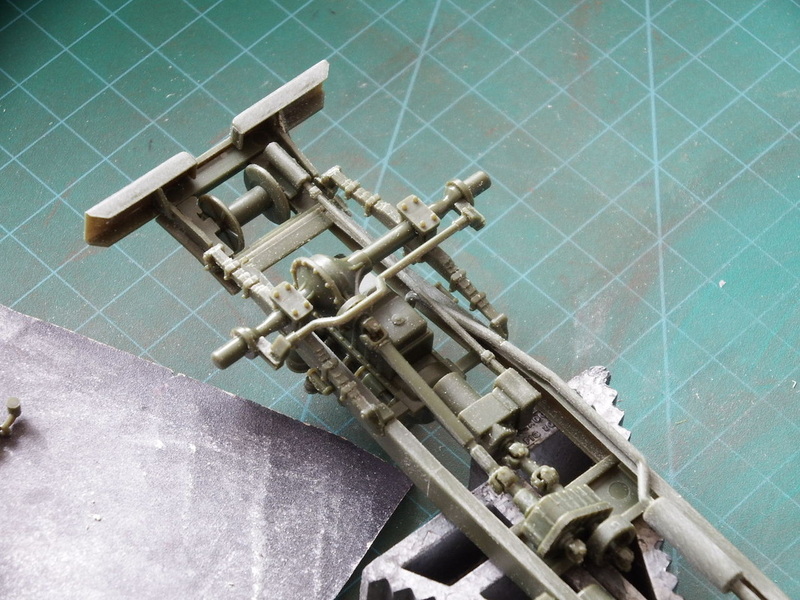 I picked these clamps up some years ago and just 'pinch' the parts together. 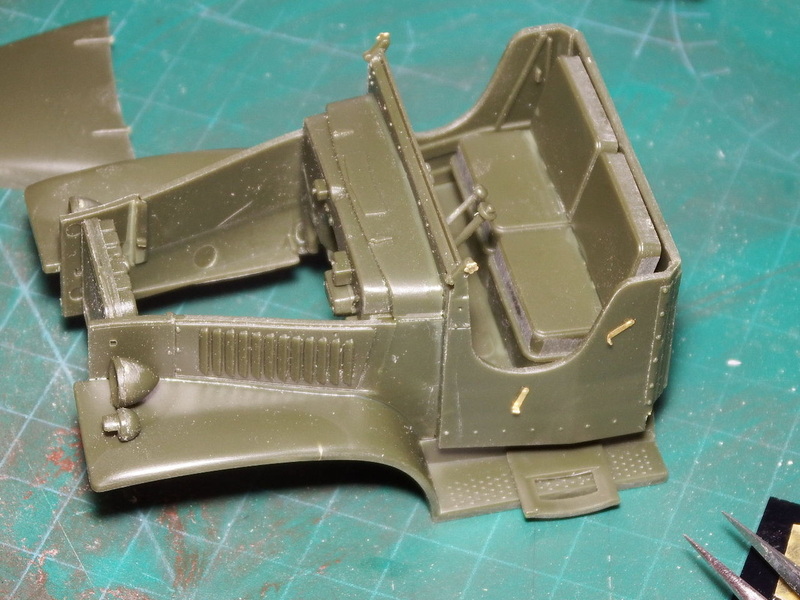 The Cab & Bonnet area isn't hard to do but you will need to have some way of bracing some of the parts. In my case, the bonnet sides were ever-so slightly warped and needed a little 'tweak'. The same also applies to the mudguards. 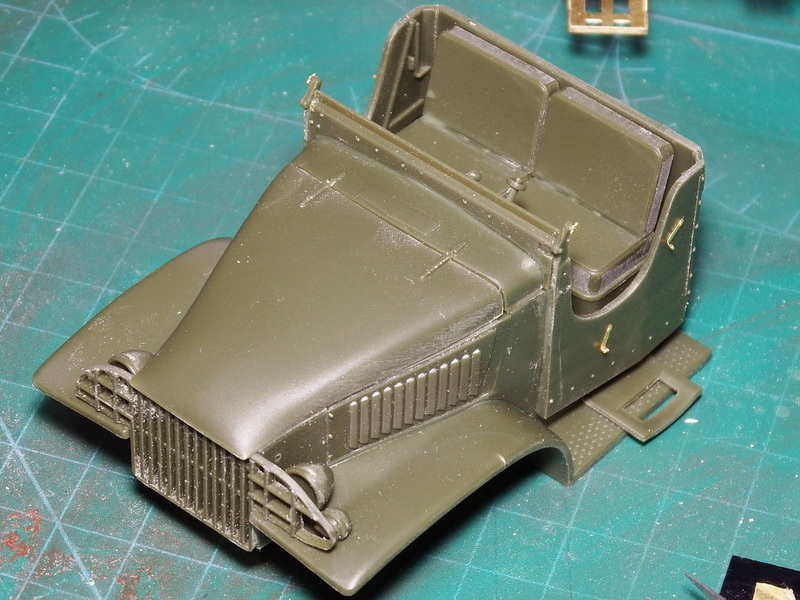 The bonnet cover and front grill are not yet glued as I need access to some of the smaller parts and headlamps. 35. All fixed together and with the air intakes added. Making sure all the parts fit flush is essential. 36. 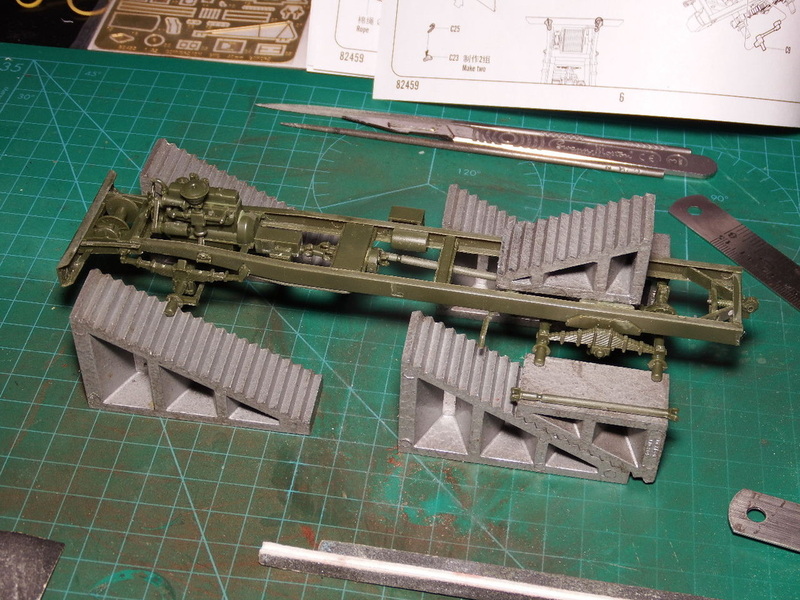 There are a few PE parts to add and they need a small amount of folding which I did with some long-nose pliers. 37. 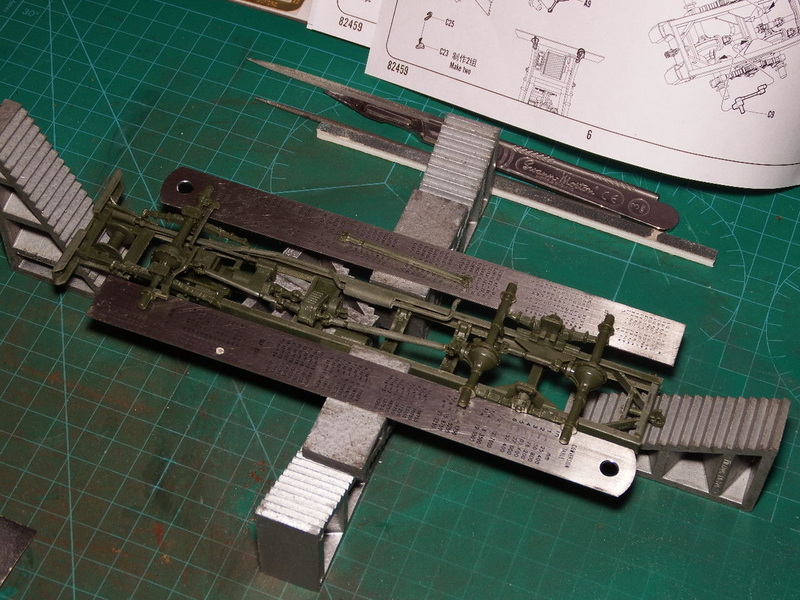 A small amount of jiggling to get the cab to fit over the engine and onto the chassis - it looks pretty good so far. 39. 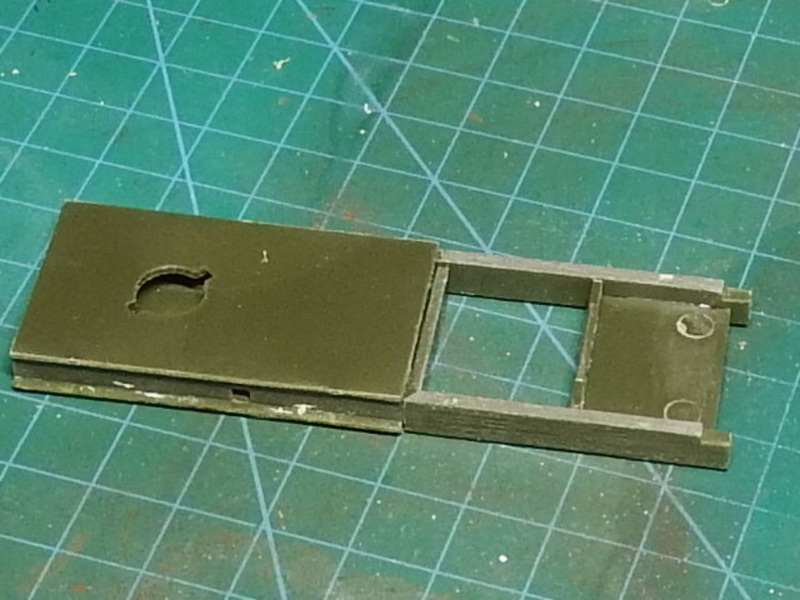 Plenty of small parts but gentle use of the sanding stick has paid off. 40. 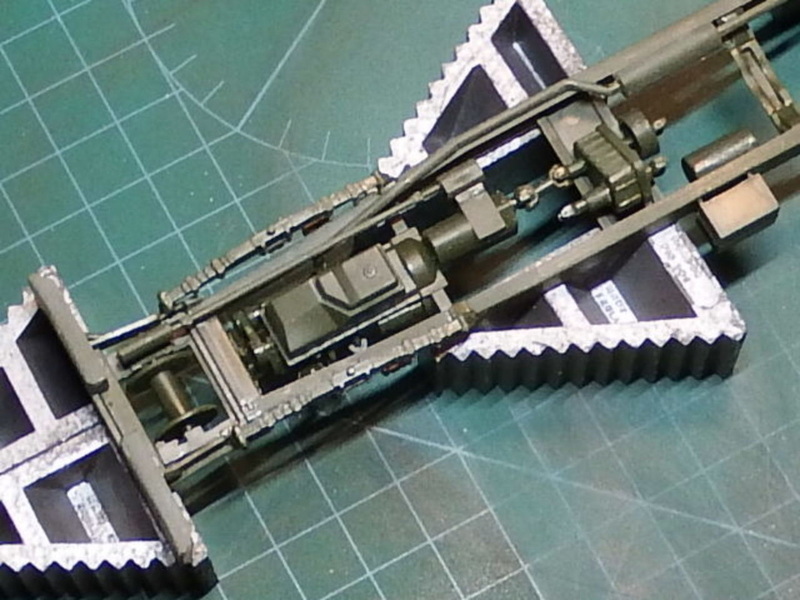 With all the PE super-fine parts added this now looks the part. 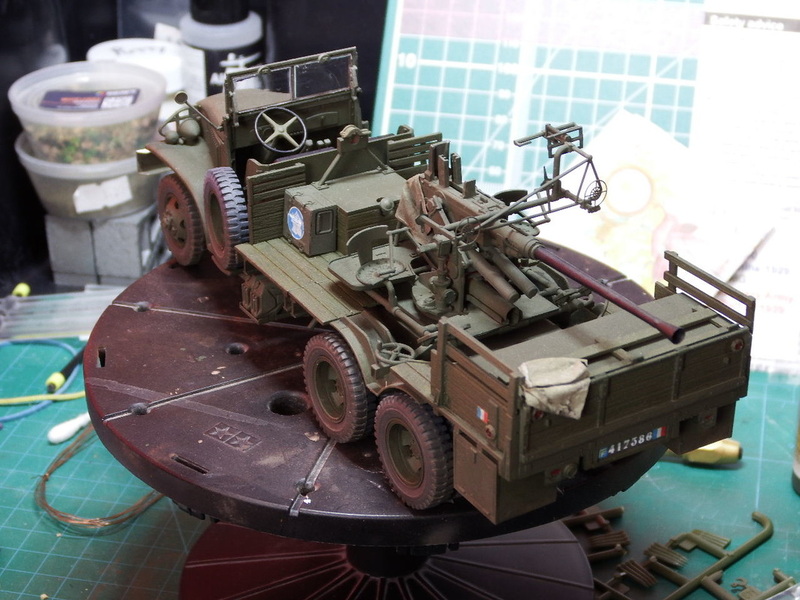 The Construction phase of this build is almost completed with just the Gun Crew Seating and the Windscreen to finish off. 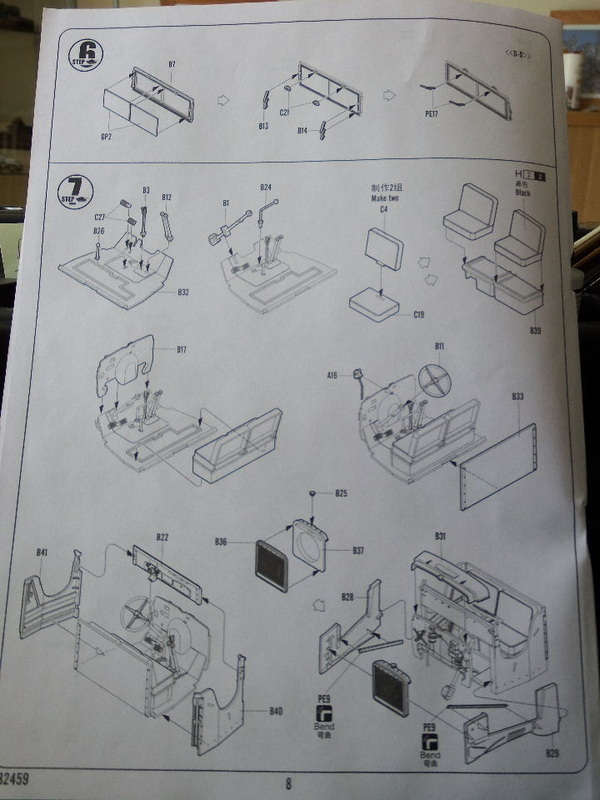 All the other parts are the 'extras' that come with the kit. 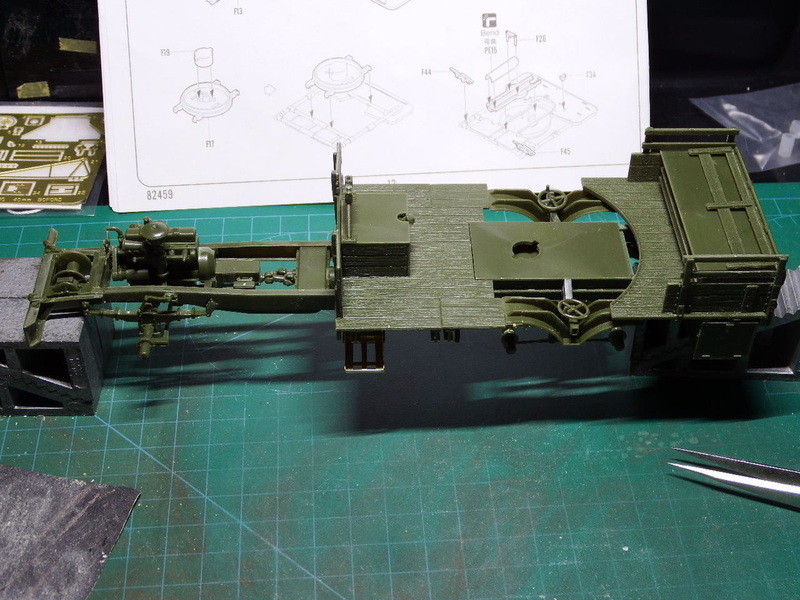 I am looking forward to the next part though........ Painting! 41. 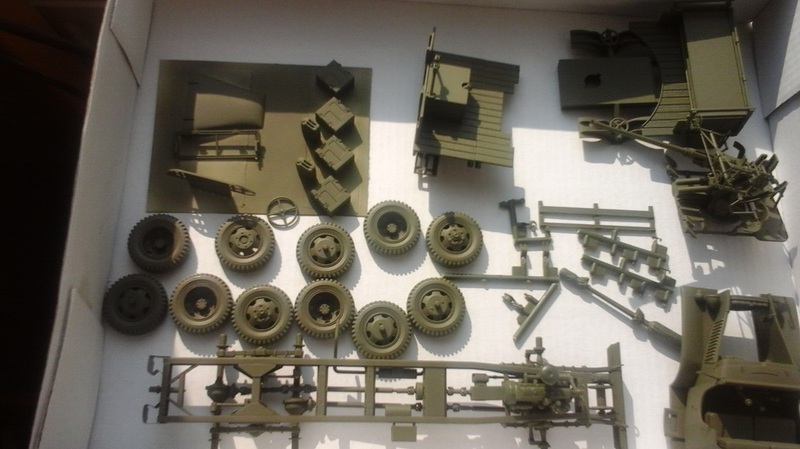 All of the kit sub-assemblies broken down and arranged for painting. 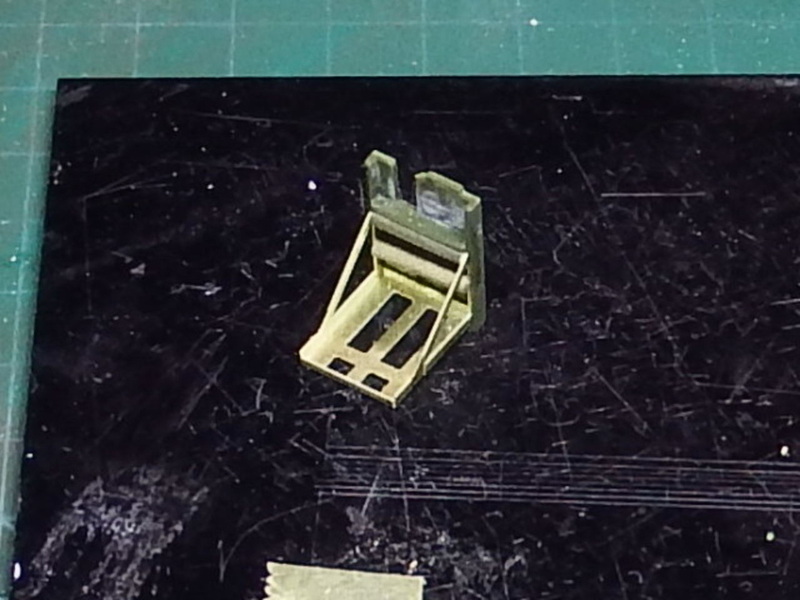 The smaller parts are taped to a piece of card for ease others, left on their sprue. 42. 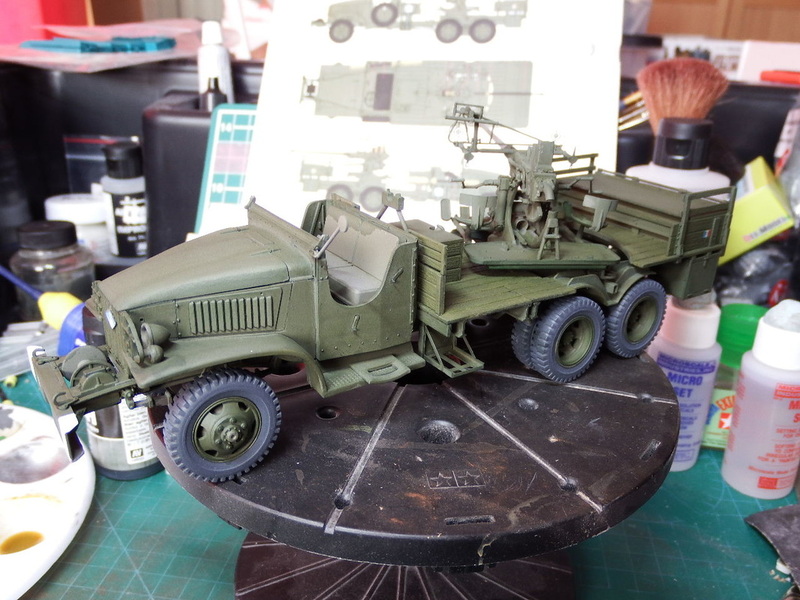 Having used Vallejo Surface Primer - US Olive Drab the parts are drying in the sun but will also be covered to prevent dust adhering to the paint. 44. With a coat of Matt Varnish, I then heavily thinned some Vallejo Wood and applied it as a stain across the wooden deck and sides. 45. 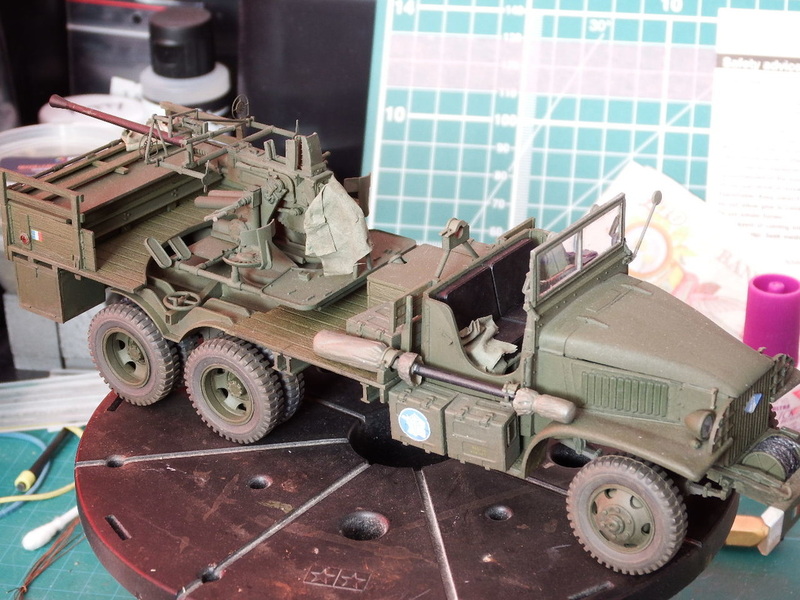 Decals were applied over a Klear base coat (applied only where necessary) and sealed with Micro Set/Sol. 46. 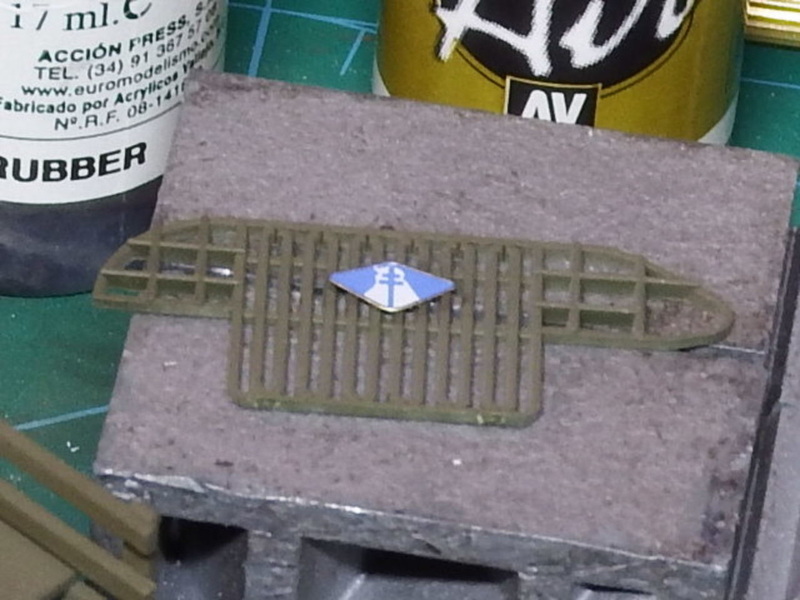 A nifty decal for the front engine grill completes the decal process. 47. 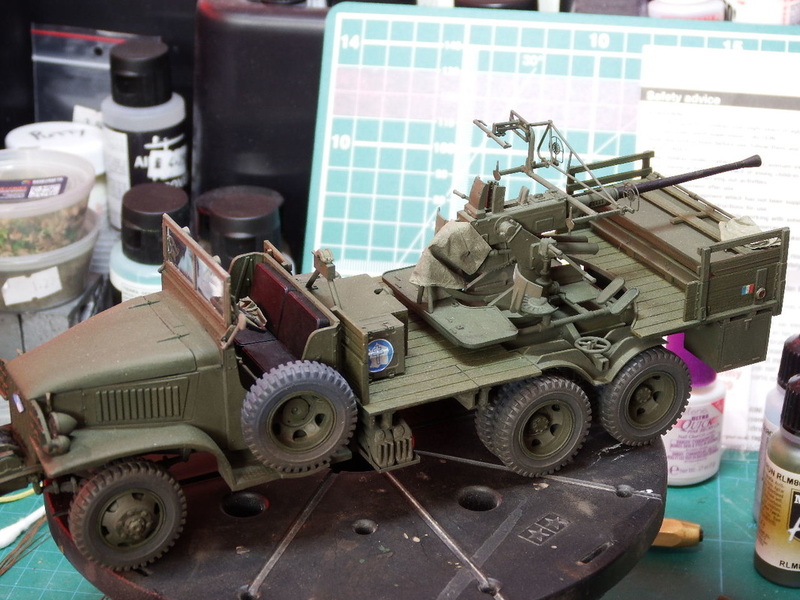 After attaching the wheels I applied a wash of Vallejo 76.519 Olive Green across the bodywork and allowed the model to dry off. 48. 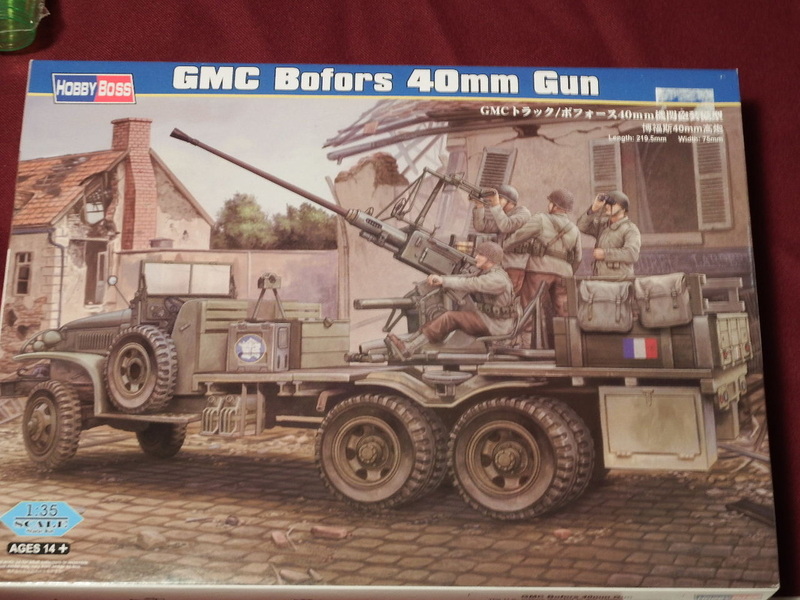 Next came the Bofors Gun. 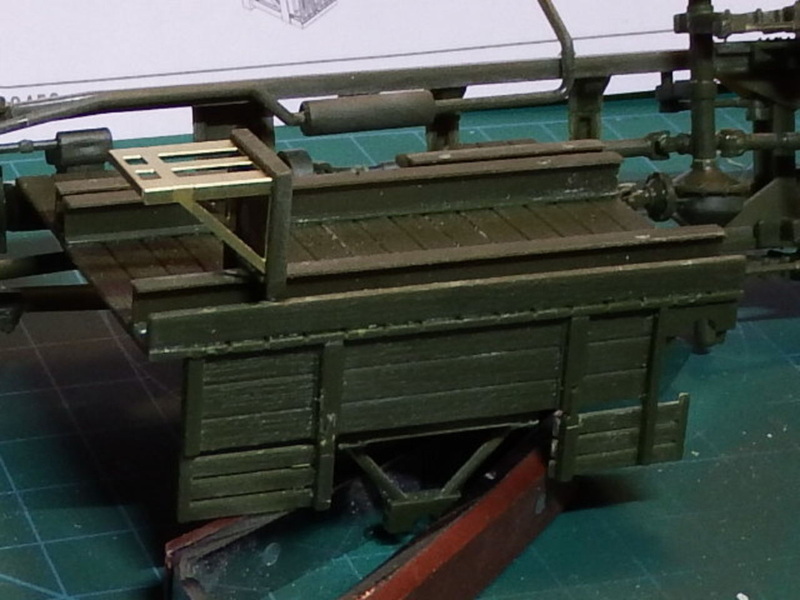 This wash has definitely darkened the model somewhat and highlighted every detail. 49. 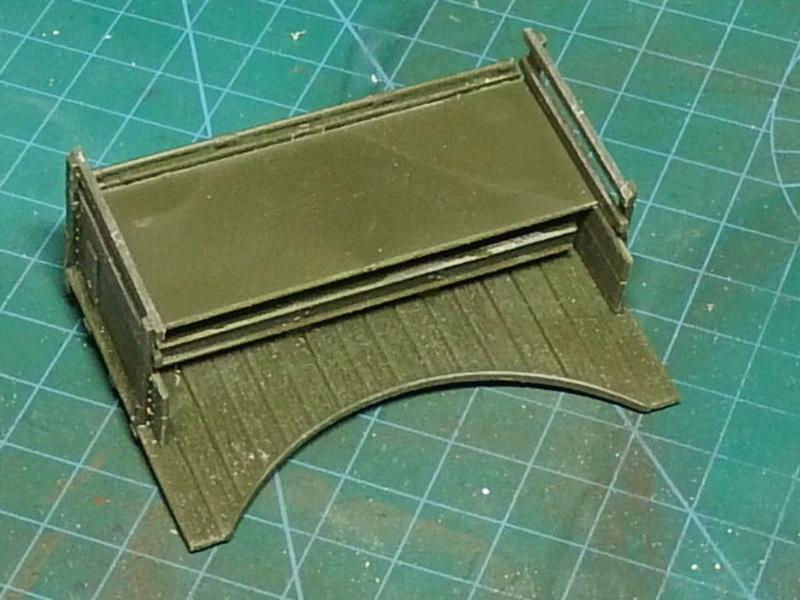 The (4) 40mm Ammunition boxes are also given a wash but most is subsequently removed from the flat surfaces with a tissue. 50. 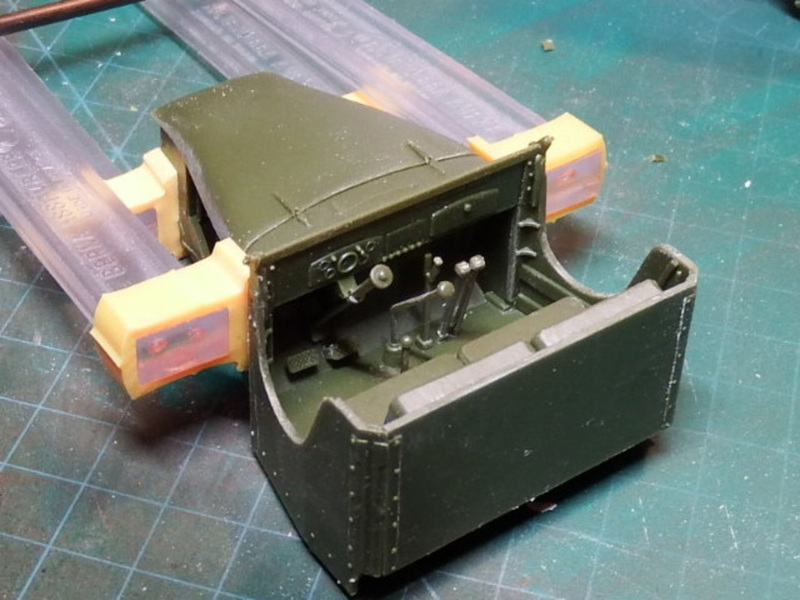 At this point, I am starting to attach the accessories to the vehicle - here we have the footplate ammo storage. 51. Note here the depth of detail highlighted by the wash. Yes! I haven't painted the lights or fitted the reflectors as yet. 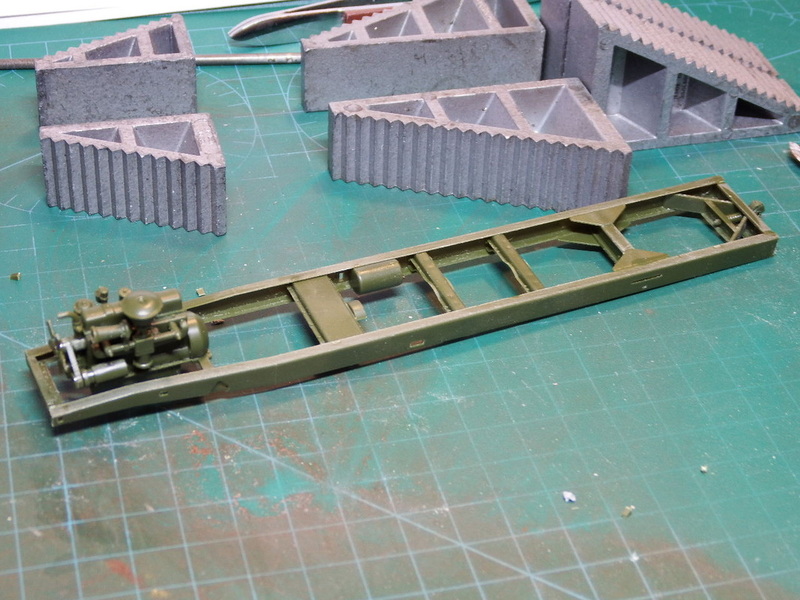 The main painting jobs are now completed with some of the smaller parts needing to be added. We shall now move on to the 'Finishing' process (which I'm still working on) so the model can be closed off as a project. 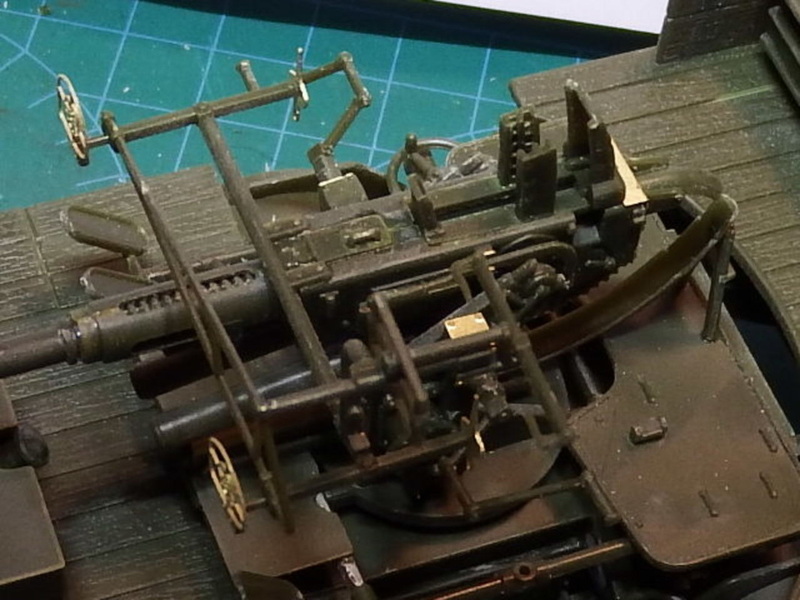 Baggage & Stowage are my primary focus here, as well as finding some suitable Crew figures - these will be wearing little personal equipment due to the constraints of being a gun crew. This precludes many of the current box sets and they are 'Combat' troops. 52. 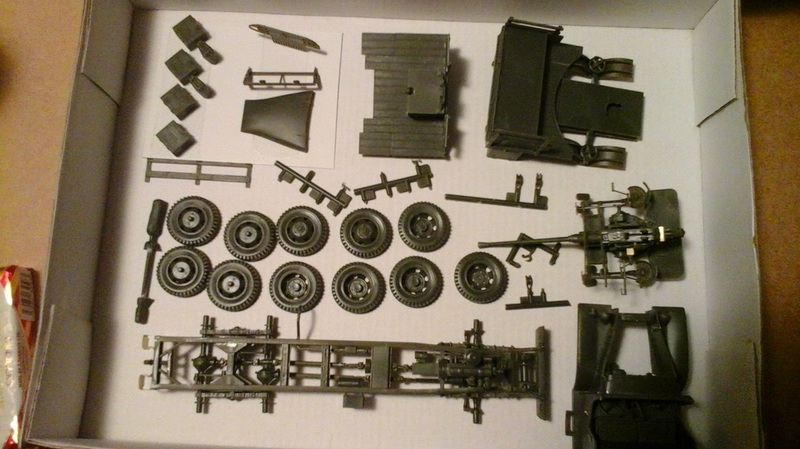 The start of the finishing process comes with adding the kit supplied accessories. 53. Tissue paper soaked in a PVA/Water mix and painted/stained with an Acrylic mix of Olive Green/Khaki were added. 54. 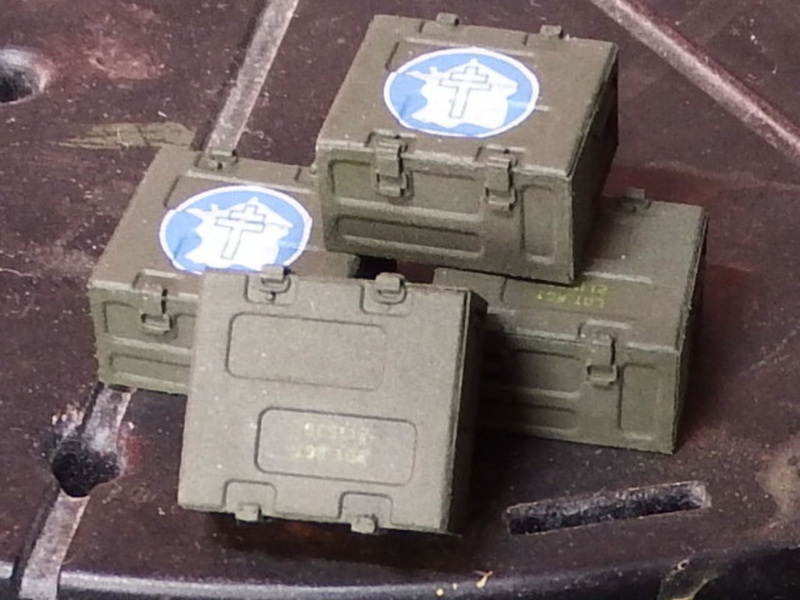 Personal kit such as sidearms, water canteens, netting comes next - perhaps some Value Gear products?